St. Mary Magdalen Catholic School is a vibrant educational community located in the heart of Central Florida. Since its founding in 1961 our parish school continues to fulfill the mission of the Catholic Church which is to teach Gospel values, build faith communities, and serve the people of the world. Currently 435 students in grades Kindergarten through eight benefit from the diverse gifts and talents of the faculty. The faculty and staff represent many nationalities bringing with them a diversity of educational backgrounds as well as richness of culture, Catholic values, and Catholic heritage. Our full and part-time faculty, representing 440 years of teaching experience, received their degrees from a variety of colleges and universities throughout the United States. The entire faculty is certified/qualified with thirty-eight percent holding advanced degrees. Nine instructional assistants support student learning by providing individual and small group skill reinforcement in the classroom. Additionally, classroom instruction is enhanced by the following departments: Student Services, Fine Arts, Foreign Language, and Physical Education. The mission of the school is to educate the whole child while recognizing that each child is unique in his/her learning ability and style. Through Student Services the school provides programs and opportunities for all children to succeed. Thirty-nine percent of the students with varying ability levels are serviced through the C.A.P.S. (Cognitive Affective Psychomotor Skills), R.I.S.E. (Revitalized Instruction for Student Effectiveness), Primary Language Arts Resource, and Title 1 programs. Morning Meeting and the BEST Program (Building Esteem in Students Today) are activities facilitated by the homeroom teachers which help create in students a sense of belonging and worth. Weekly developmental guidance classes teach students empathy, problem solving and anger management. Fine Arts are taught at all levels to students through music, art, art history, band and drama. The Physical Education Department offers students the opportunity to participate in both noncompetitive and competitive sports along with physical education instruction. The students have an opportunity to experience comradery while building a foundation of life-long fitness. The diversity of cultures, knowledge of customs, along with speaking, reading and writing of the Spanish language is the work of the Foreign Language Department. We educate the social and spiritual aspects of the students. Students have an opportunity to develop their social skills by participating in Middle School Clubs, Eighth Grade Electives, Kindergarten - Eighth Grade Buddies, and Seventh Grade-PreK-4 Partners. The Intergenerational Program, Love Circle, affords students the opportunity to develop relationships with the elderly members of the parish. For the purpose of developing an awareness of the local and global needs of society, students participate in numerous outreach programs. Living Gospel Values assist the students to recognize and respond to these needs. The important emphasis parents place on the education of their children is demonstrated by their participation in the Home and School Association, the School Board, and the Parent Volunteer Program. Home and School Association fundraises approximately $70,000 annually for the purpose of enhancing facilities and school programs. 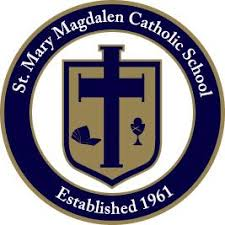 Recognizing the need for ongoing marketing and development, the School Board partnered with Catholic Schools Management, Inc. to develop a five year strategic plan to insure the financial stability and continued academic excellence of St. Mary Magdalen Catholic School. Dedicated and committed parents volunteer approximately 4,600 hours yearly enriching student learning, supporting school programs, and enhancing teacher instruction. Moving into the 21st century, St. Mary Magdalen Catholic School renovated and expanded the facilities to include state-of–the art science and computer labs, a media center, art and music classrooms, a gymnasium, and a Student Services building. In keeping with our mission statement we will continue to graduate students prepared to share their time, talent and treasure while integrating Catholic faith and values into everyday life experiences.